Mercyful (Antique Tiles) Quilt Finished! I am SO excited to have just this morning finished binding my Mercyful (Antique Tiles) Quilt. I started the quilt top in January as a donation quilt for the Mercy Hospital Hospice program that has been organized by Bernie@Needle & Foot. Please see my Mercyful Quilt Top Finished post for more information about my quilt top as well as some information about my connection to the Mercyful Quilts. This is such a worthwhile program, and I was thrilled when I found out that Mercyful Quilts is one the five charities that will be receiving quilts through the Hands2Help Comfort Quilt Challenge 2019 being hosted by Sarah@Confessions of a Fabric Addict. Below is a pic I took this morning of the finished quilt. I love how the blue sky ties in with the blue in the quilt (just luck really!). Jessie@Threaded Quilting Studio did such an awesome job with the quilting and transformed my quilt top into a quilt that I am really proud of (and one that is a little hard to part with!). But I plan to get this quilt in the mail to Bernie on Monday. This project was my first proposed finish for my 2019 Qtr 1 Finish-A-Long Goals. Linking up to From Bolt to Beauty: Brag About Your Beauties and Confessions of a Fabric Addict: Can I Get a Whoop Whoop?. I will also be linking up to the 2019 Qtr 1 Finish-A-Long Finishes when the linky party opens. 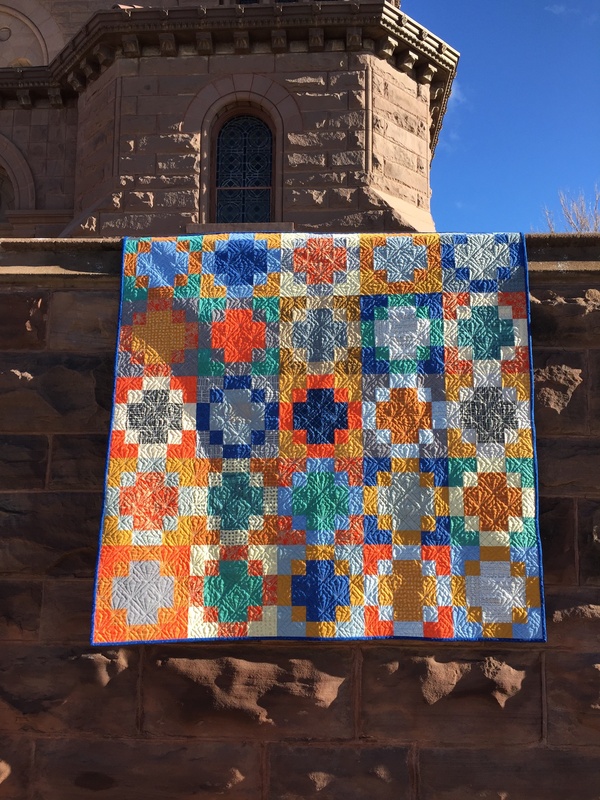 This entry was posted in 2019 Quilts and tagged 2019 Finish-A-Long, Mercyful Quilt. Bookmark the permalink. 9 Responses to Mercyful (Antique Tiles) Quilt Finished! That coincidence with the sky and also the juxtaposition to the texture and color of the building is very cool. 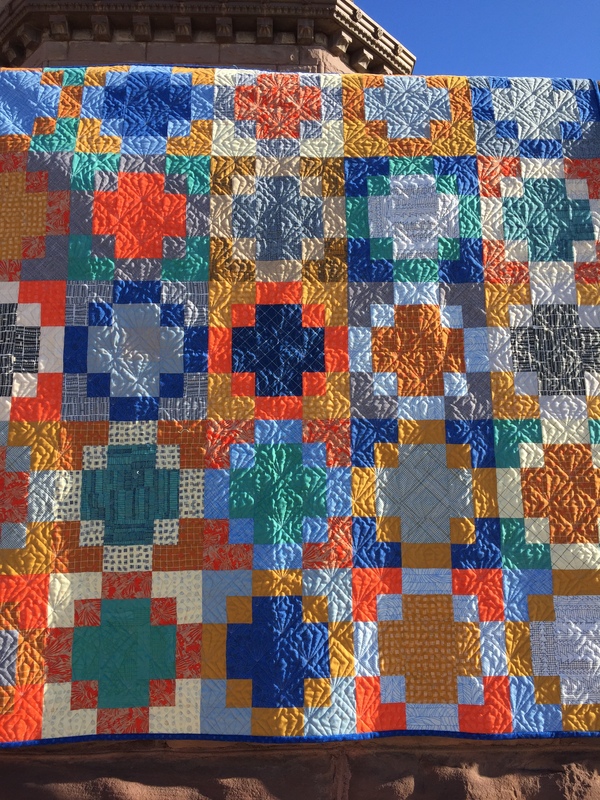 And what a meaningful act to donate something that has a quilting you really appreciate (and is quite lovely.) Its such a beautiful quilt, I wish I could find a craft (and the time) to make something so lovely to send to someone(s) who will hopefully gain great comfort from it. I can see why you are having a hard time letting go of it. The colors on this quilt just sing together! Is this all one line of Carolyn’s or a mixture? This beautiful quilt will definitely bless someone. The fabrics are so pretty and the quilting is just fabulous! The photos in the sun are so gorgeous. Nice finish. What a thoughtful mercy quilt. I love your quilt. Awesome colors. The quilting really makes the quilt sing. Congratulations on the wonderful finish, Mary, and I know it is going to mean so much to the recipient.